I'm well on my way. 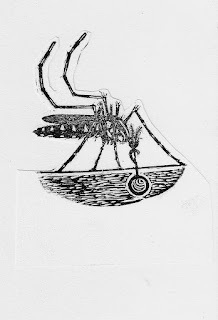 I've engraved most of the block and I'm now refining the image after taking some rough proofs. 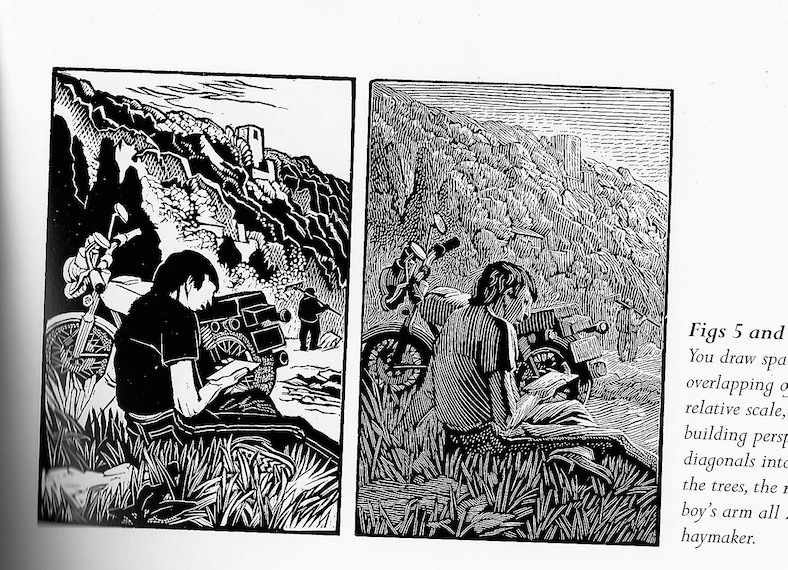 I wasn't happy with the 1st printing--I think my ink was too thick or stiff and my paper a little too rough. There's a lot of detail cut on the block that's not showing up on the paper and I wasn't sure whether to keep the background. I cut out the black background with a pair of scissors and decided that I like it better. So I went back to the block with the scorpers to clear it. Another of the first proofs, trimmed to show what it might look like without the black halo. Better. I'm still not happy with the clarity of the legs and torso. But it's pretty close. I've a little tidying up to do with the background and try to make the legs and torso a little more readable. 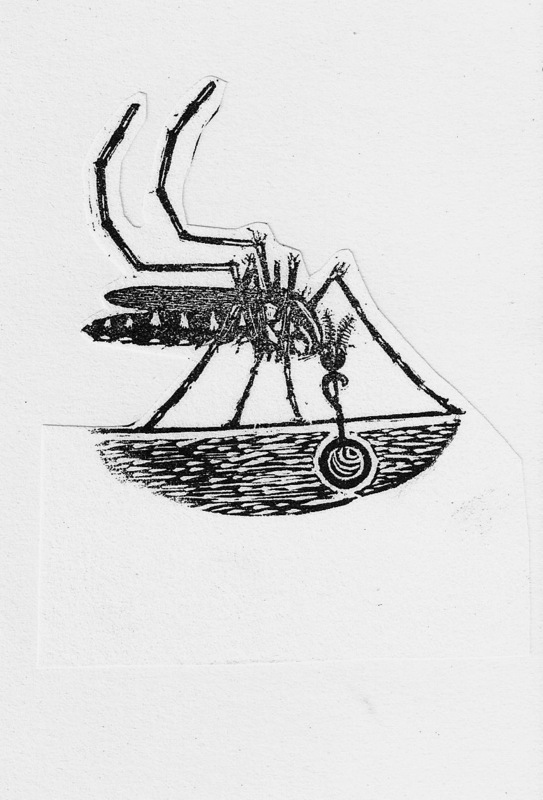 I still need to set some type for the title and I have an order for paper from Intaglio print makers on the way. So I'm on hold until the paper arrives. There are 22 people in the exchange so I need to plan on at least 25-30 copies to have enough for all the participants and still allow for bad copies or printing flubs...and once I see how easily or hard the block is to hand print, I'll decide on the total number of copies and whether there will be both a letterpress text and no-text versions. In the meanwhile there are still some corrections to make and I need to smooth the bottom of the block to allow for trouble-free (or simpler) printing. Here's the reground tip with the piece I broke off. The shortened tool, ready to go to work. 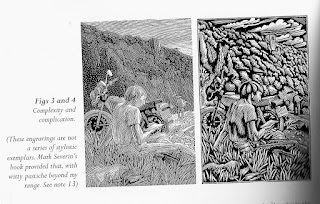 As I learned from David Sander's book on engraving, and as I've heard from a couple of full-time engravers, the tools I got from Lyons (via McClain's) as well many of the tools that came from my recent Ebay purchase are too long. For proper engraving the "mushroom" handle fits in the palm of the hand (and is the driving force) and the point of the tool should be at or just beyond the ball of the thumb for control and leverage. Many tools were sold much too long and had to be shortened. 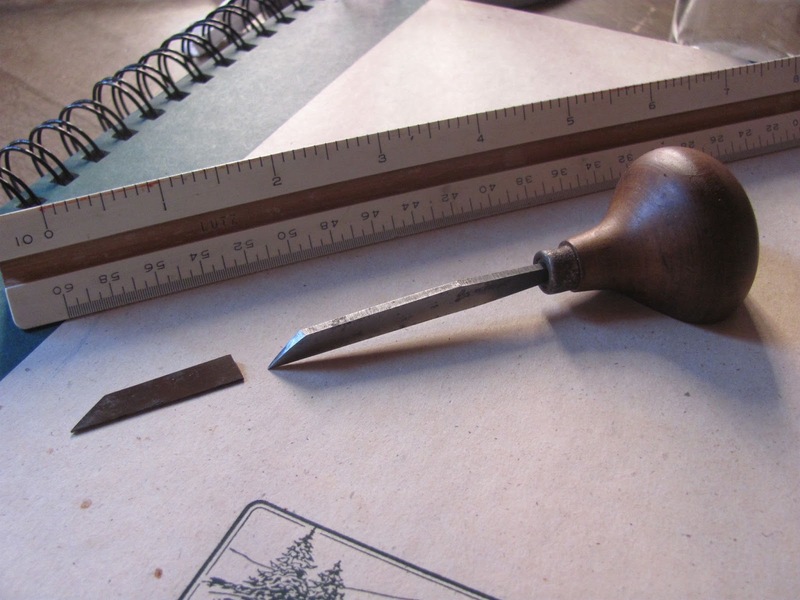 That was left to the engraver, but usually the tool would be put in a vise, and a sharp rap with a hammer would break off the tip, and a new point had to be sharpened (or the shank end was reground to fit in the handle). It's hard to get up the courage to break off 1/3 of the working edge of the tool you just bought. It feels wasteful and I wasn't sure I was up to proper sharpening. BUT, I want tools I can use, and several of these; a couple of angle tints and scorpers are missing from my tool kit and needed on the block I'm currently carving. So I've been doing 1-2 at a time, snapping them off, and then grinding them down with water stones to 30-40degree bevels and taking the time to get them really sharp. I'm cutting the legs of a mosquito, so I need very sharp tools that I can control (and decent magnification). My first clumsy engravings were really carved almost without thinking. I didn't really consider what I was doing. 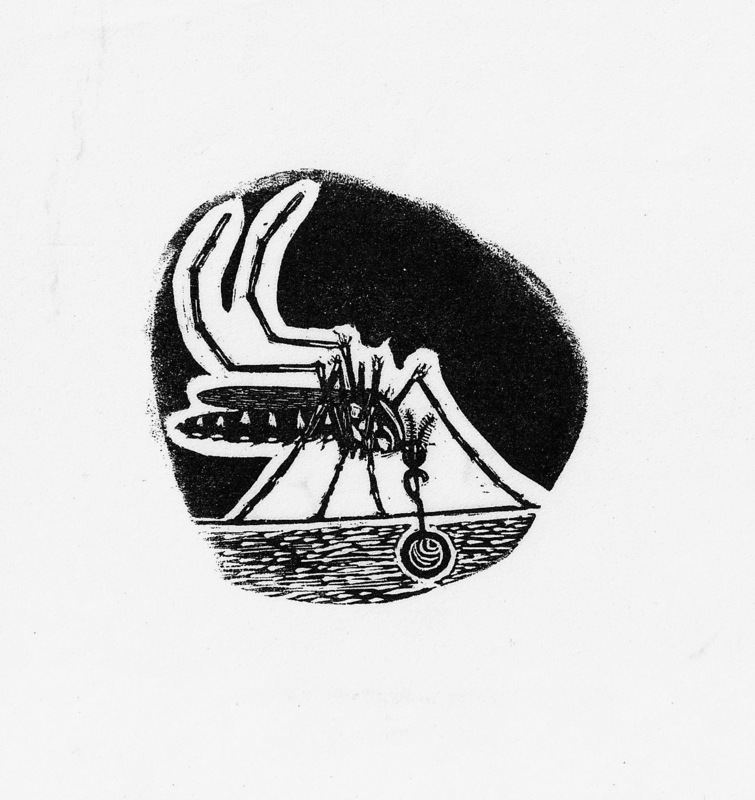 I had a block, and a couple of tools so I just cut them and printed the resulting image without giving any thought to how I was working or the still unknown ways of working in wood engraving. 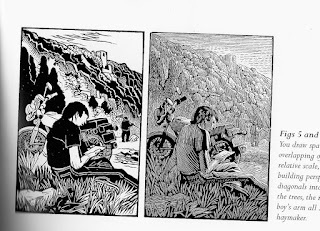 After finishing my last simple Puppet engraving, I finally picked up a copy of Simon Brett's book,"Wood Engraving How to do it", that I had purchased some time ago. I must admit that going through it has sort of stopped me in my tracks. 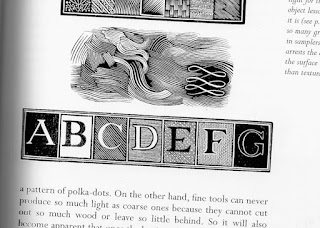 There is a great deal of useful information and illustrations: this section on how to make a "sampler" of the tools and the different ways to consider letters is really helpful. 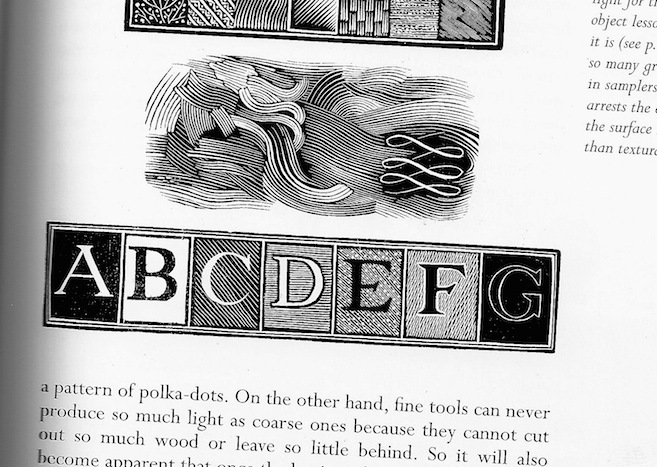 Illustration from Brett's book on engraving showing lettering styles. 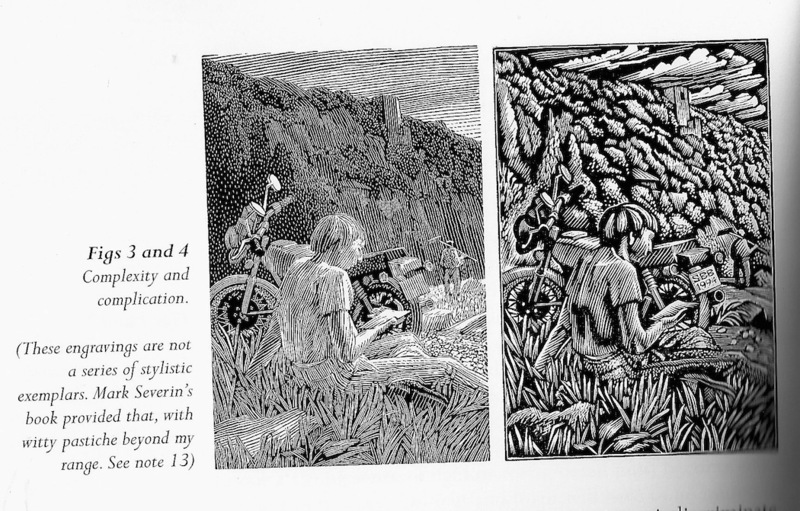 Illustrations from S. Brett's Book on Engraving. 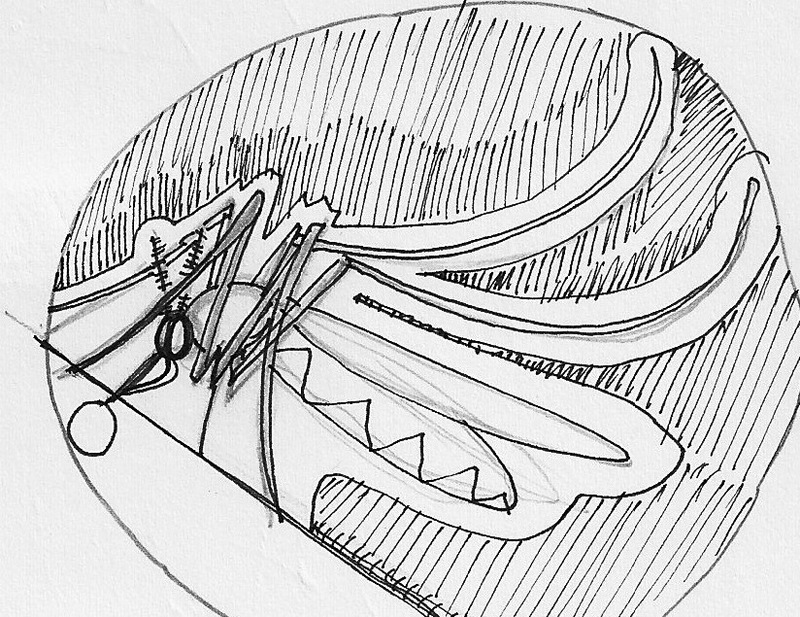 There are more examples--many more as this image gets resolved in many different ways and styles. Many aren't suited to my work or habit but in theory, I should be pulling from these as needed when solving issues of tone and depth require differing techniques. So I'm back to the block thinking: now what? I've done enough trials on scrap wood that I'd like to try a piece of real boxwood and see what the smoother cutting and fine grain will allow. 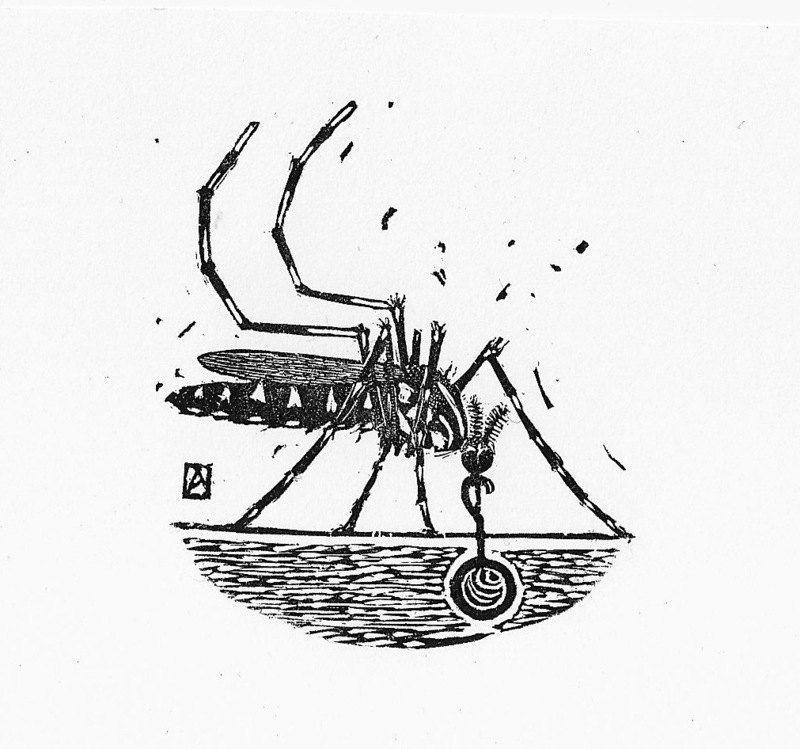 I have a small off-cut of European Boxwood that I've been saving for a small work and I have an on-again, off-again series of parasites and small insects that I wanted to add to and I have many small mosquito thumbnails that I've drawn over the last weeks and from which I managed to cobble together an image I'm happy with. The above photo shows my prepared drawing applied to the surface of my block. 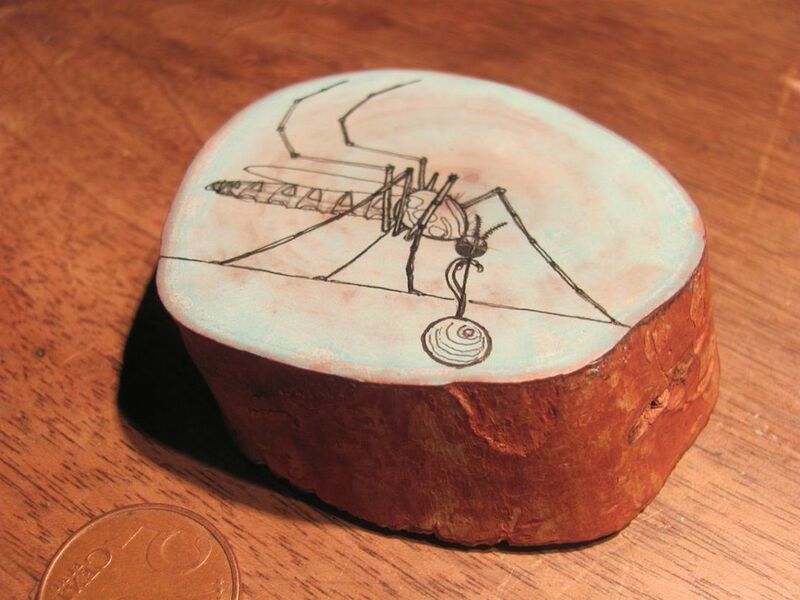 The block is just 2.5" in diameter so the image is pretty small. So now I'm ready to go but I've been hesitating. 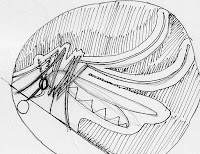 Thinking for example of how to resolve the "tiger" aspect of the alternating black and white bands of the insect legs. 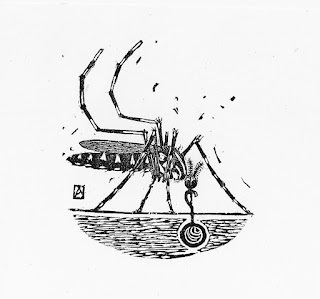 And in this case, my small frail insect on a round of box can be resolved in lots of ways.....most of which I had never even considered until now. 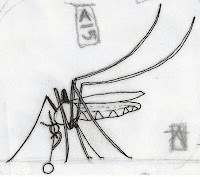 The biggest decisions--whether to carve the insect as a white drawing lifted out of the black ground or to engrave around my drawing--preserving the drawing itself by cutting everything else away which is a bit more natural for me coming from my moku hanga experience. 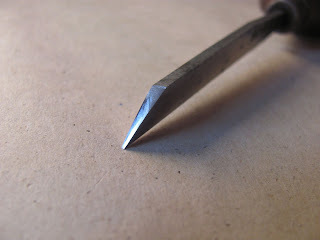 The good news however is that while I've been procrastinating, mulling over in my mind what I think I'd like to do, I've been sharpening my tools. Slowly I've been selecting the gravers I'm likely to use, and they've been cleaned and sharpened and honed and then honed again and so are actually ready to cut. Meanwhile, as I stare at the block, I have to keep the fan on as the mosquitoes are honing in on my exhaled CO2 and my bare ankles and calves under the table while I sit, inactive, thinking about the first cut.